Here it is, the last day of the month, and it's time to see how I did with April's Getting it Done goals, and to set some new ones for May. 2. Catch up on Grandmother's Choice. I'm not completely caught up on these, but I did get 4 more of them done. I think I'm about 5 behind, now. 3. Finish step one and start step 2 of the Bonnie Hunter mystery that is running in the Quiltmaker magazine. 4. Pull out and start working to finish Great Granny Squares. not even out of the UFO box. So, that's not too bad. Two completely finished and one partially accomplished. 1. Catch up on Grandmother's Choice. The weather is getting nicer, so I can do some of the hand pieced squares that I'm behind on while outside. 2. Paper piece 10 of the border units for Cactus Rose. Maybe if I break this down into smaller sections, it won't seem quite so overwhelming. 3. Finish step 2 of the Lazy Sunday Mystery. 6. Bind Disappearing Nine Patch. As for the Newfo Challenge, the quilt that I started in April, Playful Friends, is now a finished top, and the back is done for it, as well. For the may. Newfo, I really want to start the pattern called Meteor Shower. Except that I want to do this layout, pictured to the right here, that is the queen sized layout. And I'll be using much the same colours as shown here, since that is one of the things that drew my attention to it so strongly. This pattern, called Meteor Shower is found in a book by Judy Martin called Scraps. It is a FABULOUS book, but then I love all of her stuff. Between the stuff on both these challenge lists, and doing machine quilting, and being outside, and working, and going up to see our sweet Avery sometime this month, and working at the hospital, I think I just might have enough to keep me happily occupied and out of trouble. I'm sitting here in my comfy recliner, right beside the window, listening to a cardinal singing for all he's worth. It's not quite warm enough to have the window open, or to sit outside but his voice is loud enough to be able to enjoy his song. This sure is better than it was a week ago, when there was fresh snow on the ground. And the forecast is for temperatures to be up in the low 20's by the middle of the week.This is what I see as I sit here, and read, and write and enjoy my morning coffee. Another couple of days, and the leaves should be starting to come out. Matt is working on relaying the stone wall around the base of the tree, it was leaning quit badly, and then there will be garden soil and flowers planted all under that lovely tree. I'll post pictures, every now and then, as the view changes. The flowers won't be able to go in for another month, that being our usual frost free time. I've done a little bit of sewing this past week, so I have a little bit to subtract from the stash. But the main emphasis has been getting back to doing customer quilts. So far, this past week, I've done 3, with a forth halfway loaded. I'll get pictures of them posted on another day. The only cutting and sewing I did this past week was for the Bonnie Hunter Lazy Sunday mystery, currently running in the Quiltmaker magazine. I just might do some more on that before going in to work this afternoon. Balance: 85.25 more yards in than out. I'm linking to Judy's Stash Report link box. I actually don't have anything on the needles right now, because I finished, not just one, but 2 pairs of socks this week. Woohoo!! And I will repeat again, I am hooked on this hand knit socks thing. The first pair here are done with Kroy sock yarn, using 2.75 inch double pointed needles. When I first started these, I was kinda concerned that, if the stripes didn't match on each sock, it would bug me. They don't match, but it doesn't bug me. I had set these aside for a while, because I had new sock yarn arrives in the mail. (I told you I'm hooked). One of them was an Antonia wool, with raspberry, grey and pink colours, that looked like they would work for the pooling colours sock challenge that Judy Laquidara suggested. Well, they are done, and the colours pooled, and swirled and striped, and came out looking really cool. Or at least I think they did. I used 2.75 mm double pointed needles. I sort of adjusted the tension as I went, knitting some sections tighter, or looser than others in order to keep the colours pooling The differences in the tension don't seem to be obvious in the finished product. The good news is that today was a whole lot better than yesterday. Number one, I slept last night. Number 2, our taxes are done, and after an old fashioned phone call, rather than trying to do it on the internet, the government tax agency took our change of address, and hey presto...... we could fill our taxes through the internet. And better yet, we're getting some of our tax money back. Woohoo!! Lets see, what other good news do we have? 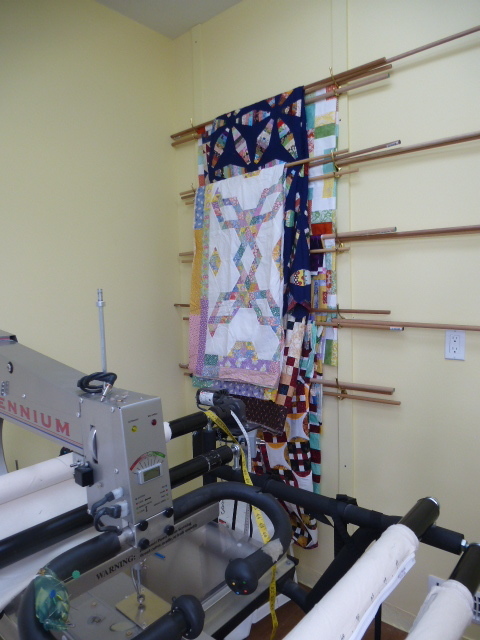 My long arm machine is up and running well, and I just finished my second customer quilt for the week. This is just a sneak peak. I seem to get a lot more done, now that my studio space is separate from the apartment area, since the distractions, like this machine I am currently typing on, are not up there. LOL!! 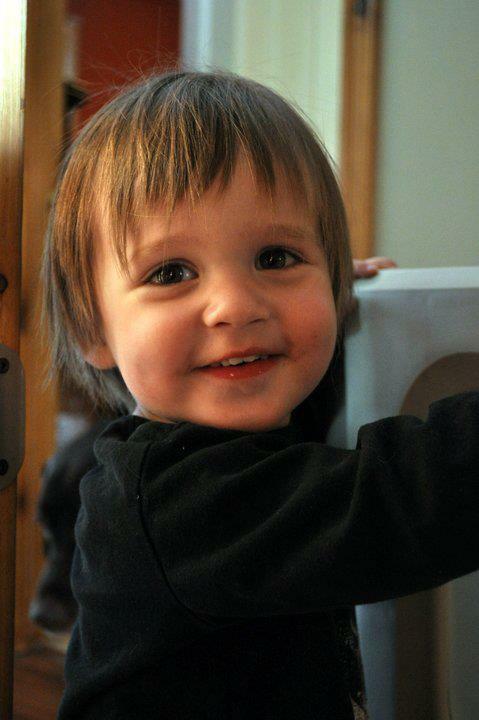 every week, and see and hear him as he grows, even though he's 4 hours drive away. And then all those other people who I have met through the blogging medium. Just in this past week alone, I have talked, though emails, with people all over Canada and the United States, and even someone in France!! As the kids would say..... "way cool". Or do they say that any more? I like this Good news Thursday thing that Judy has started. It's a great way to sit down, and take time during the business of the week, and to focus and be still and to write, and to just appreciate how good the Lord is, and to look at all the ways that He has blessed our lives. Have you ever had "One of those days"? I know you have, we all have. Mine actually started last night. I was exhausted. I wanted to sleep. I couldn't sleep. I finally ended up at about 3:30 am out on the couch, trying to fall asleep. For the last couple of years, I have been taking sleeping pills. I am now trying to wean myself off them, since they are not great to be on. Well, even if my brain wants to get off them, the rest of me isn't too terribly keen on the idea. Every time I cut the dose back, I have a sleepless night or 3 or 4. I did finally fall asleep, and woke up at about 10:45 this morning, so that wasn't too bad. I had plans for the day. 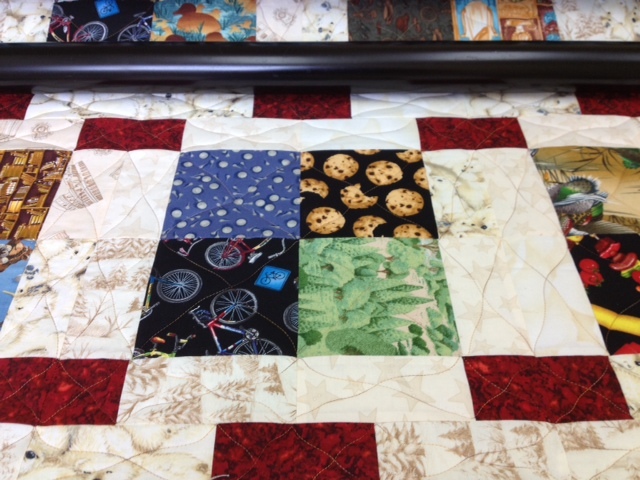 I had a quilt partially loaded yesterday, and the plan was to finish loading it, and start quilting it. I even got as far as going up and starting to work on it. Then, my phone rang. 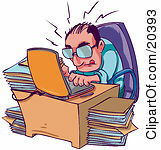 My wonderful husband has been working on doing our taxes the last couple of days. He needed some information, so I found it and came back downstairs. And I never got back up. Did you know that doing the taxes on the internet is a 2 person job? Yep, turns out it is. Did you know that you can't submit your taxes until you register your change of address with the federal Canadian revenue agency? Turns out you can't. Did you know that there is a glitch in the Canadian government website that says that you have to log into your account before you can change your address, and we were already logged in to our account, but when we went to change our address, it asked us to log into our account, which we went and did again, and then tried to change the address and then it asked us to log into our account so that we could change our address so we went back and logged into the account and tried to change our address and it....... Around and around in circles we went. I'm surprised either of us have hair left, and that the computer didn't get tossed across the room. AARRRGGGHHH!!! So, I think there is a trip to the local office for the federal government in our future so that we can change our address so that we can submit our taxes. The good part of the day was supper. I've found a local place that delivers organic produce, called Eat Green Organics It's really kinda neat having the stuff delivered to the front door. I'm a very conservative cook, and I usually don't get too adventurous in what I eat or cook. However, with the selections available, I got intrigued, and decided to try some new stuff that is supposed to be good for us. I ordered some bok choy and some Swiss chard and some beets. Tonight's supper was Pork and bok choy stir fry. It was REALLY good!! Tomorrow we try the chard, and then sometime next week we try the beets, probably roasted. There is a good movie on right now, and I think the rest of the evening will be spent watching a movie and knitting. I'll try for the quilting again tomorrow. I've been working on my getting it done challenge list for April. 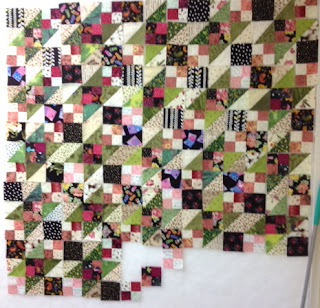 The first on the list was to get Cactus Rose out of its long neglected box, and get these 4 squares sewn together. This is a pattern by Judy Neimeyer, but I discovered when looking for the link, that the pattern has been retired, which shows how long I've had this on the go. I was really nervous about sewing this together. The instructions that came with the pattern said to make the whole 71 inch square quilt, and then do the applique. I didn't want to be doing hand applique on a project that big, so I did them one square at a time. That caused the pieced edges of the squares to stretch. But, they went together not too badly, with a little easing here and there. 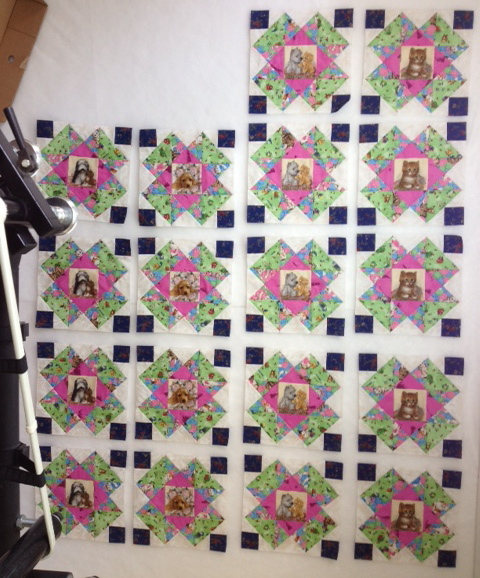 So the next stage for this one is to start working on all the paper pieced border units. I think the next few months are going to have a certain number of them assigned each month. That way it won't be quite so overwhelming. The other thing on my wall is the beginnings of step 2 in the Bonnie Hunter mystery that is running in the Quiltmaker magazine. It's called Lazy Sunday Mystery. The picture was taken with my iphone, so it's not the greatest, but it will do. 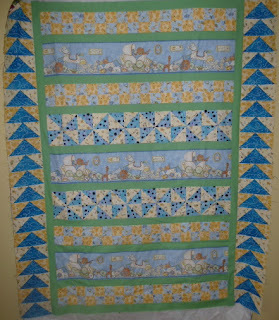 I'm linking up to Patchwork Times design wall Monday link box. Then I'm off to make myself another cup of coffee..... French Vanilla..... yummmmm.... Then I have quilts to load. I love that little kitten down at the bottom of this close up, hugging that ball of wool! I think some little girl is going to be very happy with this quilt. It has measured out to be 66" x 80", a perfect twin bed size. Ah yes, coffee..... yum......that's better. LOL!! Ok, now I can think better with the second cup of coffee going. I did lots of sewing this past week. Playful friends is finished, and so is the backing for it. I haven't got pictures of the finished product, just yet. Maybe I'll do a separate post later on today with the pictures. But here are the stash numbers. Balance: 85.65 more yards in than out. I have a quilt to bind, and I really want to rummage around in the boxes in the storage areas and dig out Cactus Rose, so those are on today's want to do list. Back at the end of March I made myself up a list of things I want to accomplish in April. And sewing together the center 4 squares of Cactus rose was on that list. Once I find them, I'll post a pic. One of the things that I want to start doing is to start posting more here. 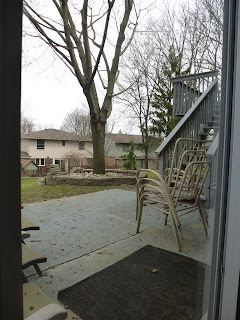 Now that all the craziness of the renovations and the move are done, there should be more time in my days to write on my blog. I really enjoy doing it, and have rather missed it. I must say that I am loving our new digs. I love the smallness and cosiness of it. I love being able to sit in my sewing area and see what is happening in the kitchen. I certainly love not having to go up and down 2 flights of stairs in order to do laundry. We just have to go down the hall, and there the laundry is. We still need to do some more unpacking and sorting. But the major and important stuff is all done, and the rest can be done in small bites at a time. I'm linking up to Judy's Patchwork Times and her stash report link box. Then I'm going to get dressed, and head up to the studio, because Charlene is bringing me some quilts. I can move on to deciding on the cornerstones. I think I'll use the same fabric as the backgrounds for the sashes, so that the blocks will end up looking like they are floating. I'm debating on what to use for the cornerstones, whether I should stick with the same dark blue as the corners of the blocks, or bring the green from inside the block out for the cornerstones. Any opinions?? I guess I should have taken a picture with both options. I did some actual quilting today, and my machine is working beautifully! I am so happy! I've had this Disappearing Nine Patch hanging around for years, so I thought it would be a good one to start with. It took me a couple of days after loading it to decide what to do with it. I didn't want to do a pantograph, and I've done a lot of continuous curves lately, so I didn't want to do that either. I decided that I'd like to do some diagonal lines, but didn't really want to do ruler work. 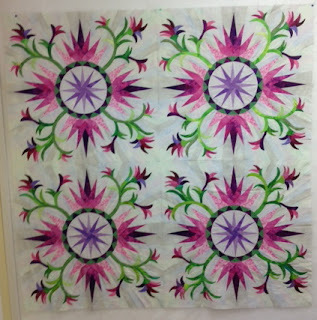 There's been a lot of talk at the guild lately about "organic quilting", which I interpret to mean, just aim and go. So that's what I did...... loosely waving lines across the diagonals of the different pieces. I like it. It's simple, and lets all the fun fabrics take center stage. It is now all finished, and just needs to get taken off the machine and trimmed, and I can decide on binding and load another. I'll take a pic once I get it all bound. I think this one is destined for the children's aid donations that the guild does. 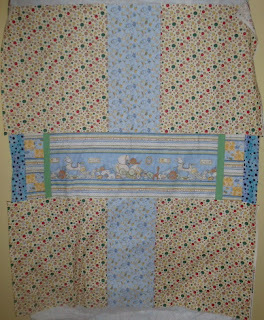 It will be nice to have a quilt that is specifically for an older child. 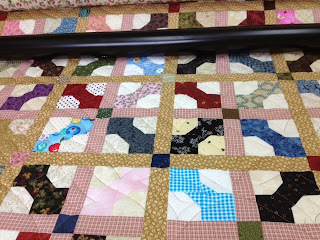 I'm linking up to Judy's Patchwork Times and then I'm going to wait for a Skype visit with Avery planned for this evening, and maybe fill the waiting with visiting some other walls. I had usage this past week, the most I've had in a very long time. WOOHOO!! I finished off the cutting for the Playful Friends blocks, and sewed up all but the last 2 of the blocks. And I made up a backing for a Disappearing 9 patch that I made years ago. It's loaded and on the Millie, just waiting for a few hours of quilting time. I wanted to load one of mine, just to make sure everything is working properly after taking her apart and then putting her back together again. It will be a good one for donating to the children's aid for an older child. I haven't quite decided on the quilting design yet. Part of me is thinking something free hand, and part of me is thinking a pantograph of some sort. I've found my boxes of unquilted tops, so I decided to start unpacking them while I was up there earlier. There are about 8 of them hanging there, with another 4 or 5 still waiting to be unpacked. I think I need to start adding mine into the quilting calendar line up. I have some new threads on order that I want to try, so that will be a good opportunity to try them out, and get some of mine done at the same time. It will also help towards my stash numbers by doing backs for them. LOL!! I've added a bit to the stash numbers this week. I've found a pattern that I want to do that is a Judy Martin design called Meteor Shower. But I needed to get more oranges for it, so I picked up 4 yards of various bright and pale oranges. Balance: 91.55 more yards in than out. I'm working this afternoon, so I'd best get linked up to Judy's Patchwork Times and then get ready to go. I keep forgetting to allow for the extra travel time to get to work, which could end up being not a very good thing, if I end up late to work. I have the socks for the yarn pooling challenge on my needles. And there is definitely pooling happening. When I was doing the ribbing at the top of the socks, the colours were almost totally stacked on top of each other. I didn't do anything special to get them to do this, either. I cast on 60 stitches on 2.75 mm needles and did k2p2 ribbing. I'm at the point of starting the decreases for the toes. What will be really interesting will be to see if the second sock does the same thing. We have been having internet connection problems, so I'm going to make this quick, while the connection lasts. I'm linking up to Judy's On the Needles. I have added 7 more blocks to this quilt, which I think I will call Playful Friends. There are 10 more blocks to do, then I can add sashings and cornerstones. I had thought to put the same blue as the corner squares in the blocks as cornerstones, but it looks like I don't have any of that left, so I'll have to find something else. I want there to be a nine patch where the blocks and cornerstones meet. I really thought I had some of that blue left, but I can't find it anywhere. And this is what the other end of my studio looks like. Maybe Millie will get put back together later today. There is one more trip to Ikea in our near future. I saw this fabulous idea for storing threads and pantographs on the blog Tamarack Shack I think I will be using this idea, and hope that it will keep me at least semi organized. Once Millie is all set up, and the drawer units installed and filled, I can decide if there is enough room for a work surface to go along the length of that wall on the right. I'm thinking a surface about 14 feet long, which is the length of that wall, with shelves underneath it for wide width backing fabrics that I'd like to have both for myself, and to also offer to my customers for backing for their quilts. In between the shelves would be openings to allow for up to 3 people to sit for possible sew in days. And then up above that work surface would be some wire shelves for storing batting and other bulky, but light weight stuff. That back wall is going to have a system to hang quilts that are waiting for quilting. And there is going to need to be one very essential piece of equipment in there that isn't there yet....... some sort of step stool or ladder. Because otherwise I won't be able to reach anything. LOL! So, for the rest of this afternoon, I'll be making chicken soup for supper, and sewing on some more of these Playful Friends blocks. I'd like to do something totally revolutionary, for me at least, and actually keep working on it until it is finished. 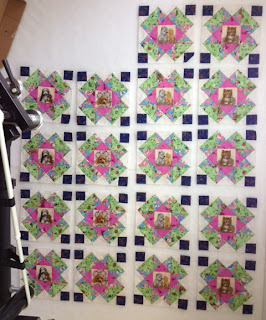 I'm linking up to Judy's Design wall Monday. There's lots of fun stuff to look at over there. I've already spent part of the morning looking and drooling over some of the projects. It's done. We're moved. Let the woohoo's begin!! We started early yesterday morning, and I mean early. I saw the sunrise for the first time in many many years. We picked up the rental truck at 7 am. 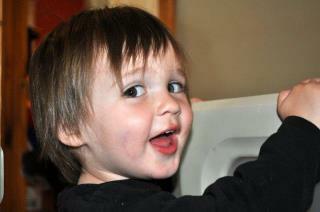 everything went smoothly, and the truck was returned at about one in the afternoon. Now all that remains is unpacking the boxes that remain, and slowly sort things out. What an IMMENSE relief, to have this great big and long process done. Now I can start to actually think about and talk about something else. This is our living room area with the furniture in it. I'm currently sitting on that couch, with my feet up, facing towards the fireplace as I type this. This is facing towards my sewing area, most of which is hidden by the couch. This could turn out to be a good thing. Because this is what it currently looks like back there. But it will soon get better, once the boxes get out of there, and I figure out an easy way to sort out the leftover strips and squares that will go into their specific sized areas. I did some sewing this past week, so I have stash out to report. Not a lot, but some. Balance: 94.5 more yards in than out. The rest of today is going to be a rest day. Sew a bit, knit a bit and do some more sewing. I'll work some more on the puppies and kittens quilt, and maybe start to catch up on the Grandmother's Choice block of the week. And I think I might even do a bit of cooking, and try something new in my new kitchen. We went out to the local Costco with Becca a week or so ago to pick up some of those K-cups for our Keurig coffee maker that Brian and Lisa got for us, and while there I saw and picked up a package of really nice looking sweet peppers. So, I'm going to try making up some stuffed peppers. I found a recipe online that looks fairly easy to do. Judy has a linky box up on Thursdays, where she asks us what has happened in the past week that we are thankful for. I am thankful for my new, so close to being finished that I can taste it, studio. It now has a design wall. And a large one. It measures the full width and height of the front wall. Now this may not seem like a big deal, but I've been without a wall for months, so it is exciting to be able to have one again. So exciting, in fact, that I had to try it out. Those blocks are 13.5 inches each. Here's a close up. 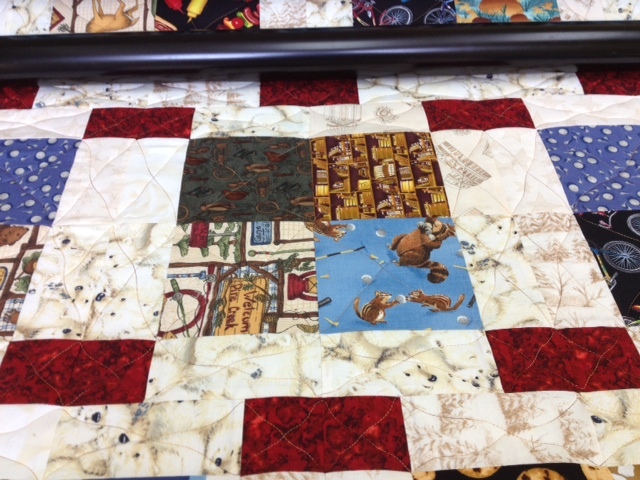 This is the beginnings of the quilt I was playing with in EQ7 the other day. It looks completely different than the original. The quilt and I had differing ideas of the colours it would be done in. I wanted it to be as gender neutral as possible, but the quilt had ideas of its own. I've had this kitten fabric in my stash for years, just waiting to be used, and it did seem that it went perfectly with the puppies and kittens in the centers of the stars. But there's pink in it, so instead of it being gender neutral, it is becoming very little girlish. And then I found this green fabric with fun animals and birds on it. It insisted that it had to be in this quilt, and I agreed that it was a good fit. The only thing is that now, the stars have lost their prominence, and the pink around the center square has now taken the center stage. But, considering that the center fabrics were the beginnings of this quilt, that isn't necessarily a bad thing. I think I'm going to take it easy for the rest of today and play with this quilt some more. Tomorrow is the day we take the long arm machine apart, and I must confess to quite a bit of nervousness about the prospect. I'm hoping it goes well, and hoping even more that it goes back together properly and will function as well or even better than she does now. I have some new parts on order, since it seemed a good time to install them, considering she'll already be in pieces. Taking a few more off won't seem quite so much of a big deal........ 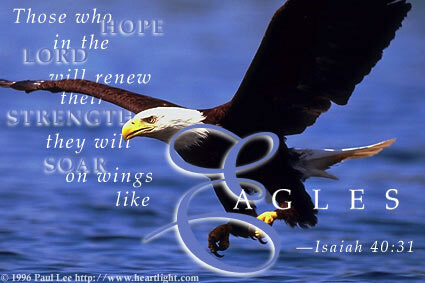 I hope. The yarn that I ordered from Webs arrived yesterday in a lovely squishy package. One of them in particular was ordered specifically for this challenge. It's a rather bad picture of the colour, but it shows the dye distribution. It's an Opal yarn. I went looking to see if I could find a better picture of the colours on their web site, but their picture isn't great either. It ranges from burgundy to pinks to greens and greys. Even if the colours don't pool, they will be pretty socks. The instructions for the challenge requested a picture of our yarn, accompanied by a March calendar. So here's that pictures, with the yarn all wound into a ball and ready to go. I just might start working on these today. I'm linking up to the Pooling yarn selection post. time. It was originally purchased so that I could use some of them in an I Spy quilt. That quilt has long since been done, but there are still a lot of these squares left. I spent some time thins afternoon playing in EQ7, to see of I could come up with something where I could fussy cut these fun pictures, and use them as the center of something. This is what I came up with. The puppies and kitties will be the center of the stars. The blocks are going to be big, since the center squares will finish at 4.5 inches, so the star blocks will be 13.5 inches each. I'm going to start cutting today. I already have about half of the center squares fussy cut. Maybe I'll do a post later this evening with an update of how far I've gotten. This is going to be fun. I think EQ says that this quilt measures 67"x83". This should put a dent into the stash numbers, depending on how far I get. This design wall post is being brought to you from my new studio, and a temporary design wall system. The baby quilt that I started last month is finished, as is the backing. 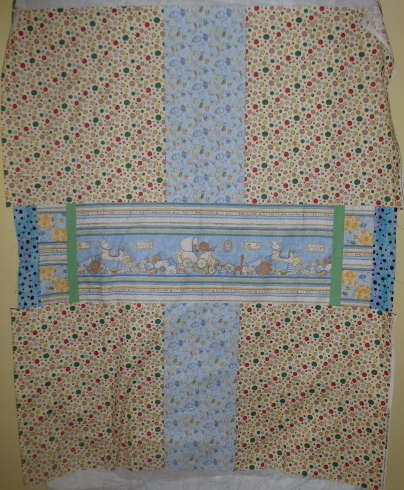 Once it is quilted, it will be bound in the green that has been used in the quilt as borders. of the quilt. I used the last of the border strips in the middle of the backing, so it does relate to the front. I'm hoping to get the permanent design wall put up this week. I think we're going to go with some foam insulation sheets, covered with batting. That will give a small bit more of insulation for the space, and also something to pin into. I'm linking up to Judy's Design Wall Monday, and then I'm going to go press the half square triangles that I finished for the mystery yesterday, before going in to work this afternoon.